The United Methodist Church with whom we are affiliated is a mainline Protestant denomination and a major part of Methodism. We trace our roots back to the revival movement of John and Charles Wesley in England in the 18th century with the Great Awakenings in the United Kingdom and North America. In the 19th century our main predecessor, the Methodist Church, was a leader in Evangelicalism which maintains that the essence of the gospel consists in the doctrine of salvation by grace through faith in Jesus Christ's atonement and the authority of the Bible as God's revelation to humanity and spreading the Christian message. In April 1939 three Methodist bodies – The Methodist Episcopal Church, The Methodist Episcopal Church South, and The Methodist Protestant Church united to form The Methodist Church. Almost 30 years later in April of 1968, two churches that had distinguished histories and influential ministries in various parts of the world joined hands at the constituting General Conference in Dallas, Texas, to form a new denomination. The Evangelical United Brethren Church represented by Bishop Reuben H. Mueller, and The Methodist Church represented by Bishop Lloyd C. Wicke made the pronouncement with these words “Lord of the Church, we are united in Thee, in Thy Church and now in The United Methodist Church”. Jerry Shofner wrote in his book entitled History of Jefferson County, “a Methodist church in existence at Waukeenah in 1828 was the earliest Methodist house of worship in Jefferson County”. It is not clear just when they began to have regular services by resident pastors. They had irregular visits by various ministers and services were conducted by lay people for a few years. Transitory ministers held church services frequently in private homes during that time. Records show that in February 1828 Waukeenah Methodist worshipers met at the plantation home of John Gamble to hear a Mr. Williston preach before he left for ministry in St. Augustine. Then in May 1828 Lieutenant James Gadsden’s brother, Christopher, a South Carolina minister, held services at Gadsden's Plantation here. This is the same James Gadsden that served in the military under Andrew Jackson who was ordered to supervise the rebuilding of the destroyed British built fort that existed during the war of 1812 on the Apalachicola River. So impressed was Andrew Jackson with Gadsden's work, he named the new post Fort Gadsden. Fort Gadsden Historic Site, part of Apalachicola National Forest, is located near Sumatra, Florida, and is one of America's most significant historic sites. The Waukeenah Methodist Church as we know it was established in 1837 according to Florida Conference records and, again, services were initially held in homes. Shofner also wrote “The Methodist Church was more fortunate than some of the other denominations in establishing their churches”. The Waukeenah “church” remained and grew during the territorial evolution and as the territorial period ended in the mid-1800s Methodism was well established. The Florida Methodist Conference was created in 1842. On September 24, 1853, Maria E. Ulmer, widow of Charles Tullis Ulmer, deeded to the trustees of the Methodist Church in Waukeenah, an acre of land. Maria Ulmer was the great grandmother of the late Gladys Russell Walker of Lamont. Her husband was Dr. William Henry Walker. She was a very active member of the Lamont Methodist Church which was on the Waukeenah Circuit. This deeded land became the site of our first church building and was located on the grounds of the now Waukeenah Cemetery. That first church was built by slaves and was made of hewed logs fitted closely together. The windows were only shutters, but they were thick and sturdy, probably more for protection than anything else. The men took their muzzle-loading guns with them to church and armed guards were posted outside the building to prevent a surprise attack from Indians. At this time the Indian War was over and most of the Indians had been removed but many were still around and some had returned. The first seats, or pews, were also made of logs with the top hewed smooth. After a sawmill was located near the St. Marks River, wooden benches were made from lumber. At that time, logs were floated down the river to the mill and lumber was hauled by ox carts. Since men and women were not permitted to sit together, a slot or square cut was put in the middle of the back of the benches to separate the men from the women with a stick or pole. A few of these benches are still stored at the present church. In 2005, one of those slave-built pews was used to fashion the alter railing in the present Waukeenah church sanctuary. About 35 years later with that original church being in need of much repair, the decision was made to build a new church and move it nearer to town. Brother R. H. Howren, the pastor of the church at the time, supervised the construction of the second Waukeenah Church, a wood framed building, on property secured from the Ames Estate in 1887 and located west of hwy 259 just north of the crossroads. Lumber for this structure was given by the late Senator W. C. Thomas, who was also a church trustee at the time. Some names listed in the church roles at that time; Bellinger, Carter, Connell, Grantham, Hightower, Odor, Wooten, and Wethington. and land to Melvin Buzbee. 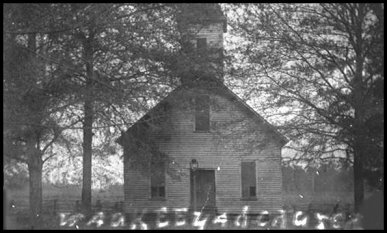 The new church was to be built on the site of the old Waukeenah School since the old school building (built in 1936) and land had been sold to the church by the Jefferson County School Board (some 6 years earlier) for the grand sum of $1.00. The former school would provide ample space for the much-needed classrooms as well as a fellowship hall and indoor restrooms. All that was needed was a sanctuary. The first materials were delivered and construction of the third church building was begun in December of 1959. Many people contributed money, time, and effort to help build our new house of worship. The spindled alter posts (in present sanctuary) were salvaged from the previous church (they are possibly 125 years old) and the pews still in use today were passed on to by the Monticello First Methodist Church when they purchased new ones for their sanctuary. The first worship service in the new sanctuary was on September 11, 1960......56 years ago. After the death of Mr. Sam Grantham in 1974, the fellowship hall (former Waukeenah School) was named and dedicated the “Sam Grantham Memorial Fellowship Hall” in his memory for over the years Sam did so much for the church; served on all the committees, was Sunday School Superintendent, Sunday School teacher, church bell ringer, and any other jobs that needed doing. That building is used for classrooms, fellowship meetings and dinners, Fifth Sunday dinners, fish fry fund-raisers, wedding receptions, parties, family reunions, and in the past was used for The Woman's Home Demonstration Club meetings, square dances, Boy Scout meetings and, for many years was the place for lively political forums and still used today as the voting pole during elections. In 1990 all the windows in the church, except the front two that were earlier done, were replaced with beautiful stained glass windows, purchased and donated in honor of various church families. Then in 1991 the old fellowship hall was renovated and a fully-equipped kitchen was installed. The old school stage remained for various performances. In August of 1996 we purchased the Hwy 27 road front property for additional parking and visibility from that major highway. A lighted sign was added with regularly changed inspirational messages reminding passersby of God and His wonderful love. Continued growth and vision prompted the construction of another building in 1996. Named the Brinson Delano Buzbee Educational Building, it provided four additional classrooms, storage room, Pastor's study and two restrooms. In 2003 the church acquired 1.66 acres of land adjacent to the church property and cornering on US 27 and SR 259. A former home on the property was renovated and used as the Youth Center for a number of years until it was demolished when it fell into disrepair. A block building that had served as a grocery store in the mid-1900s is used presently by our United Methodist Women's group as a Thrift Store with proceeds going to mission projects both local and foreign. Until 1992, Waukeenah Methodist was on a circuit and our pastor served more than one church; at one time as many as five churches. Waukeenah, Lamont, Wacissa, Chaires and Sardis Methodist Churches were on this circuit. Presently the circuit includes only Waukeenah and Lamont Methodist Churches. We have always furnished a parsonage for our pastors. The first home was built on the St. Augustine Road near where the first church was built. The second wood frame parsonage was located on the west side of Hwy 259 about ½ mile north of the crossroads in Waukeenah. After many years of use, it was replaced by a new, more heating and cooling efficient brick home in 1973. Well, this is the story about land and buildings, but it is also about the strong resolve and faith of our fore-fathers to keep the Waukeenah United Methodist Church alive and moving forward for 179 years. In the future I imagine there will be other buildings but, let us not forget, the strength of the Church will always reside in its people who are motivated by a strong belief in Almighty God and the furthering of His Kingdom on earth. Even before the very first church building was erected in 1853 (on land donated by Maria Ulmer), two acres were acquired from Alexander and Silety Jernigan in August of 1841 and laid out as use for a burial ground. The oldest grave in the cemetery is that of Charles Tullis Ulmer dated July 20, 1842, the husband of Maria who donated the acre of land at the same location to build that first “House of Worship”. The cemetery is a historical, pre-Civil War cemetery and contains graves of many of the former residents and saints of the Waukeenah Church and community as well as many veterans who served in the Indian War, Civil War, Spanish American War, WWI, WWII, and Korean War. Many prominent names appear in the list of those buried here. Among them are plantation owners, doctors, legislators, pastors, early settlers and relatives of royalty. There are many unmarked graves. In 1995 an additional 1.2 acres adjoining the cemetery was donated by the Lyman Walker III family. Located at it's entrance is a beautiful sign that includes a large engraved plaque giving the history of the cemetery and was donated by Mrs. Florence Bellinger in memory of William H. Bellinger. A flag pole to honor our veterans stands toward the center of the Cemetery and next to the flag pole is a brick memorial with an inlaid brick cross for those buried in the cemetery without markers. As these are identified, homemade primitive metal name plates are fashioned and placed on top of this memorial. As funds allow, we are replacing the homemade plates with professional stone markers. In 2011, our website www.waukeenahcemetery.com was created by Karen Buzbee Walker. Go there and find policies and procedures for burials, pictorial histories, alphabetical listing of persons buried and reserved plots, past workday photos and much, much more. It is a beautiful old cemetery maintained by donated funds solicited annually in the spring in conjunction with a designated work day.